Proton pump inhibitors (PPI) are a commonly prescribed therapy to patients in the emergency department. Esomeprazole and pantoprazole are the two PPIs available for clinicians to prescribe at our place. Esomeprazole is recently off-patent and sold by 3 different manufacturers in Australia. It was initially solely marketed by AstraZenaca under the trade name Nexium. Pantoprazole is off-patent and sold by 17 different manufacturers in Australia. In the community, the cost per 40mg esomeprazole it is $1.25. For pantoprazole it is $0.55. Our department cost per dose is $1 for esomeprazole and $0.05 for pantoprazole i.e. esomeprazole is twenty times more expensive than pantoprazole. Due to this difference in economic cost, a literature review was undertaken to determine whether treatment with esomeprazole, compared with pantoprazole, lead to different clinical outcomes for patients. 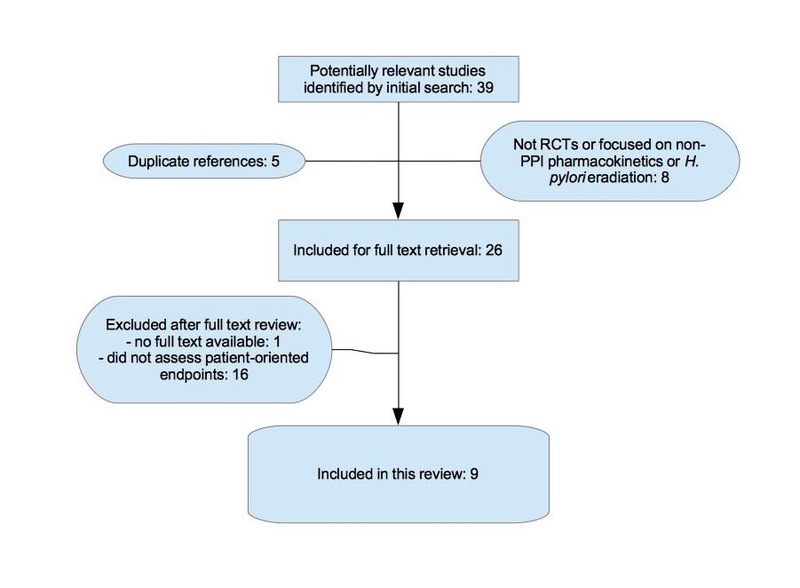 PubMed and Medline databases were searched using the terms “esomeprazole” AND “pantoprazole”. The publication type was restricted to randomised clinical trials, the subjects were restricted to humans, and there were no restrictions on language. 39 studies were identified. 5 of these results were references that were doubled up, leaving 34 studies. 8 studies were excluded because either not randomised control trials, they were assessing H. pylori eradication, or they were studying the pharmacokinetics of other drugs in response to esomeprazole/pantoprazole therapy. 16 studies were excluded because they assessed intragastric pH and did not address any patient oriented outcomes. 1 study would have been included however only the abstract was available; the original manuscript was not accessible. 9 studies assessing patient-oriented outcomes were included in the final analysis. Moraes-Filho et al 2014. n= 588. Composite end-point of acid suppression and subjective symptom resolution. No difference in acid suppression with better symptom resolution in the pantoprazole group. Goh et al 2007. n=1303 Composite end-point of endoscopic resolution and subjective symptom relief after healed oesophagitis. No difference between pantoprazole and esomeprazole. Zheng et al 2009. n= 137. Reported no difference in endoscopic findings but claims that esomprazole achieved better symptom relief compared with pantoprazole. In the first 3 days of therapy esomeprazole was statistically superior but this was not clinically significant. By day 6 of therapy there was no statistical difference in reported symptoms. Labenz et al 2004/5. n = 517. This large industry-run trial was one trial published as two separate trials, much like NINDS 1-2 (alteplase for acute ischaemic stroke). One compared 20mg esomeprazole to 20mg pantoprazole with a composite primary endpoint of endoscopically diagnosed remission of GORD, and subjective symptom relief (n=2766); the other trial compared 40mg esomeprazole vs 40mg pantoprazole for endoscopic healing of erosive oesophagitis after 8 weeks of therapy (n=3151). The 20mg trial had a primary end-point of the number of patients with endoscopic and concurrent symptomatic remission. At 6 months 94.3% of esomeprazole subjects were heartburn free compared with 90.5% of pantoprazole subjects; statistically significant but of doubtful clinical significance. Glatzel et al 2006. n=561. There was less relapse and less symptomatic episodes of reflux in subjects using pantoprazole 40mg compared to esomeprazole after 7 days of treatment. The symptom assessment tool was a validated reflux questionnaire. Barchan et al 2007. n=588. This solely industry-funded trial found that in patients with erosive GORD, there was no difference in 12-week remission rates (defined as endoscopic and symptomatic resolution) between esomeprazole and pantoprazole (76% vs 76%). In their conclusion they claim esomeprazole is superior to pantoprazole on the basis of a post hoc secondary outcome per-protocol analysis at the 4-week mark. Gillessen et al 2004. n=227 No difference between 40mg esomeprazole and 40mg pantoprazole at 10 weeks for endoscopic and symptom resolution of erosive GORD. Trend favours pantoprazole. Scholten et al 2003. n=217. Statistically significant faster resolution of symptoms in subjects with GORD treated with 40mg pantoprazole (3.7 days) vs 40mg esomeprazole (5.9 days). Scholten et al 2007. n=236. No difference in on-demand relief of reflux symptoms of subjects treated with 20mg pantoprazole vs 20mg esomeprazole. Where other PPIs are a racemic mix of R- and S- enantiomers, esomeprazole is the only single isomer PPI, being the stable S-isomer of omeprazole. The clinical significance of this is doubtful. In industry-sponsored head-to-head trials between omeprazole and esomeprazole, using the disease-centred outcome of intra-gastric pH, it is heralded with great fanfare that 40mg of S-isomer omeprazole (esomeprazole) causes more gastric acid suppression than 20mg of S-, R- racemic omeprazole (Schmitt et al, 2006). Such straw man comparisons serve to promote sales, not human wellbeing. Of the 9 studies which incorporated patient-oriented outcomes into their primary end-point, 6 studies were neutral, 2 studies favoured pantoprazole, and 1 study favoured esomeprazole. None of the differences detected appeared to be of clinical relevance. None of the studies assessed subjects presenting to an emergency department with symptoms suggestive of acute GORD. The available published evidence demonstrates that esomeprazole therapy compared to pantoprazole does not provide any clinically meaningful patient benefits. This author recommends removing esomeprazole from all ED drug impress formularies in hospitals where esomeprazole costs more than pantoprazole. It can go hang out in the bin of discarded drugs to keep ketorolac company. The money saved can be put to a better use building capacity within our public health system rather than maximising profits for shareholders of AstraZeneca. Better yet, the PBS should stop subsidising this outrageously profitable me-too drug. Based on ABS+PBS prescribing data from the 2013/14 financial year, in a non-hospital setting, if pantoprazole had been prescribed instead of esomeprazole, there would be another $102 million sitting in Australian treasury coffers, but that’s a rant for another day. The author is an Australian tax payer. Schmitt, C., Lightdale, C. J., Hwang, C., & Hamelin, B. (2006). A multicenter, randomized, double-blind, 8-week comparative trial of standard doses of esomeprazole (40 mg) and omeprazole (20 mg) for the treatment of erosive esophagitis. Digestive Diseases And Sciences, 51(5), 844-850. Noted! Well said and researched Tom, Thanks.